Political scientists assert that, among the numerous reasons that prompt states to go to war, few are as tempting as the diversionary theory. This thesis asserts that states will start international wars in an effort draw public attention away from domestic problems. While the Falkland Islands War of 1982 is the archetypal example, some students of military history may be inclined to include the Mexican War of 1846-1848 in their analyses of the diversionary theory. At quick glance, President James Knox Polk's decision to provoke a war in 1846 may be seen as a response to the myriad political problems that plagued the United States throughout the early 1840s. The president's overriding desire for more land certainly provided a sop to Southerners whose hostility to the growing abolitionist movement threatened to paralyze the federal government. Rather than strengthen the ties of Union, however, the war effort only served to estrange Northerners from the Polk White House. In his Biglow Papers, the Massachusetts poet James Russell Lowell printed the following poem that amply explained New England's hostility to 'Mr. Polk's War:' They just want this Californy So's to lug new slave-states in To abuse ye, an' to scorn ye, An' to plunder ye like sin. Although New England's threat to separate from the Union in protest to the war proved shallow, the struggle for influence over the newly acquired territories further estranged Northerners and Southerners and took the nation one long step closer to war. As a unifying element, therefore, the Mexican War was an unparalleled disaster. The cheap victories that the United States Army won over Mexico's ill-led forces, however, had a positive effect on the nation's economic development and, as a result, its standard medium of exchange: the silver dollar. The South's bumper cotton crop that overloaded the world market in 1839 ruined countless American banks and plunged the entire country into economic stagnation. This situation remained unchanged until U. S. troops under the command of General Zachary Taylor exchanged shots with Santa Anna's forces just north of the Rio Grande River on April 25, 1846. Following Congress' declaration of war on May 13, the nation's economy continued to improve through 1848's Peace Treaty of Guadalupe Hidalgo. 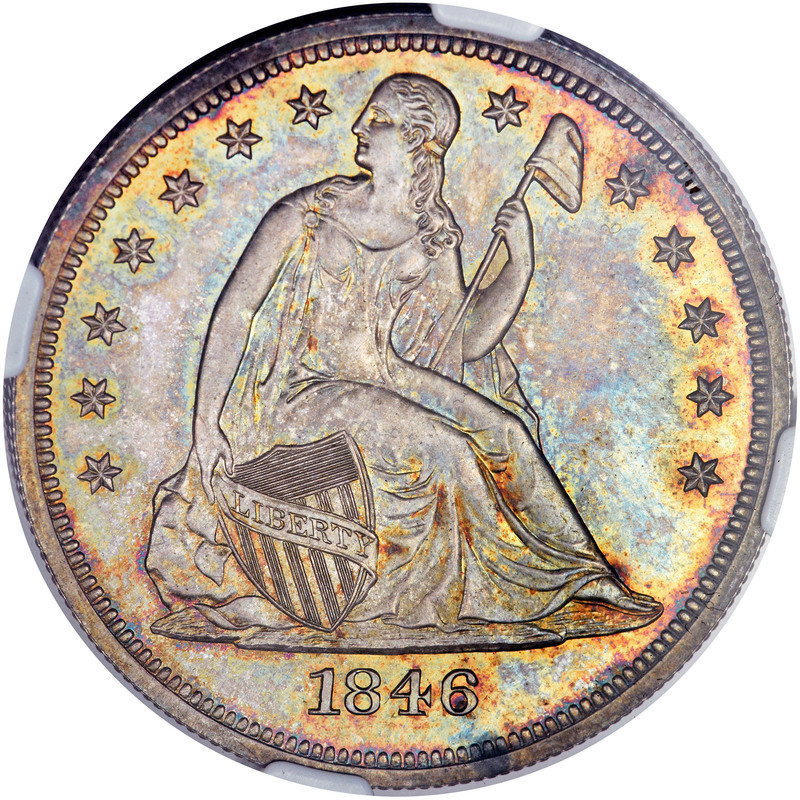 While the Philadelphia Mint's delivery of 110,600 business strike silver dollars in 1846 was rather high by the standards of the 1840s, few Mint State survivors are available in today's numismatic marketplace. 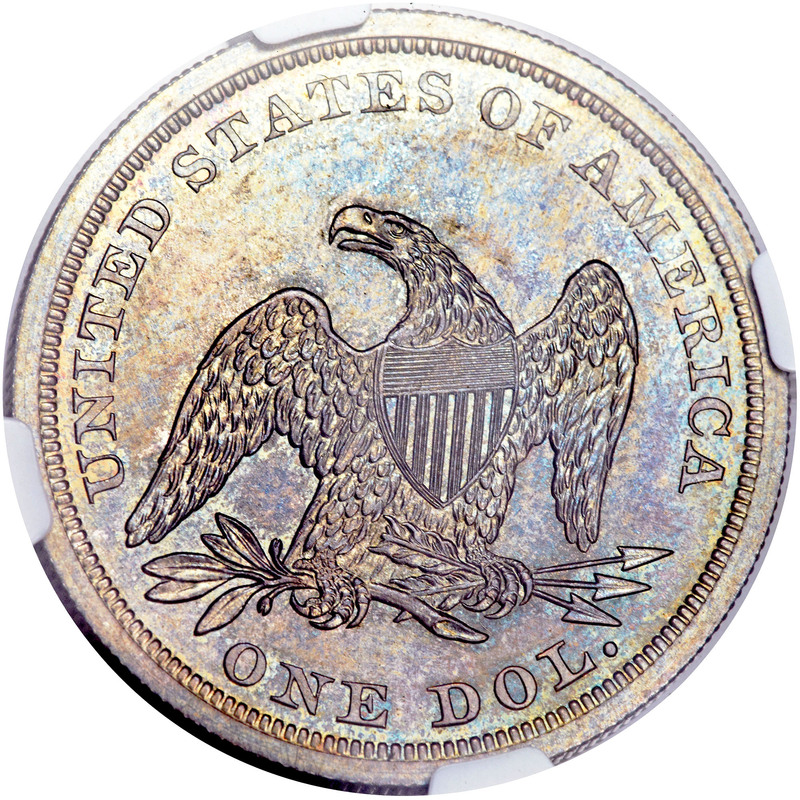 Readily available through the About Uncirculated grade levels, it is obvious that this issue saw heavy circulation in America's reinvigorated commercial channels. 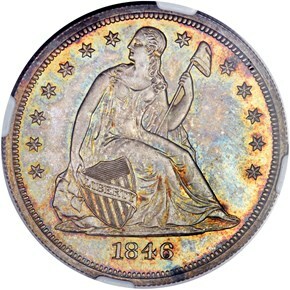 The Philadelphia Mint's production of proof Seated dollars in 1846 reached the previously unimagined total of between 40 and 60 pieces. In his book Silver Dollars and Trade Dollars of the United States: A Complete Encyclopedia, Q. David Bowers asserts that the federal government may have intended to use many of these specimens as gifts for diplomats and/or military officers in connection with the ongoing war. Since this explanation is difficult to substantiate, we offer the explanation that the Mint Director may have foreseen increased proof sales in response to people's improved economic standing.